Boo-licious ghost brownies – recipe from Around My Family Table. 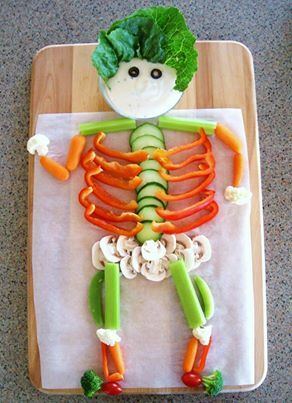 This is a great make together for even the youngest children. Melt the chocolate, then dip pretzels halfway into the chocolate and gently shake to remove excess. Dry on a rack. Decorate eyes and mouth with black icing. Wait until dry and then package in plastic pretzel bags available at craft or baking stores. 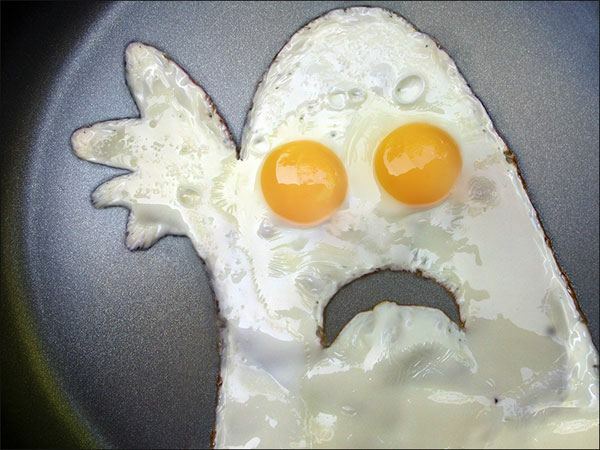 This egg might require a ghostly talent to prepare? 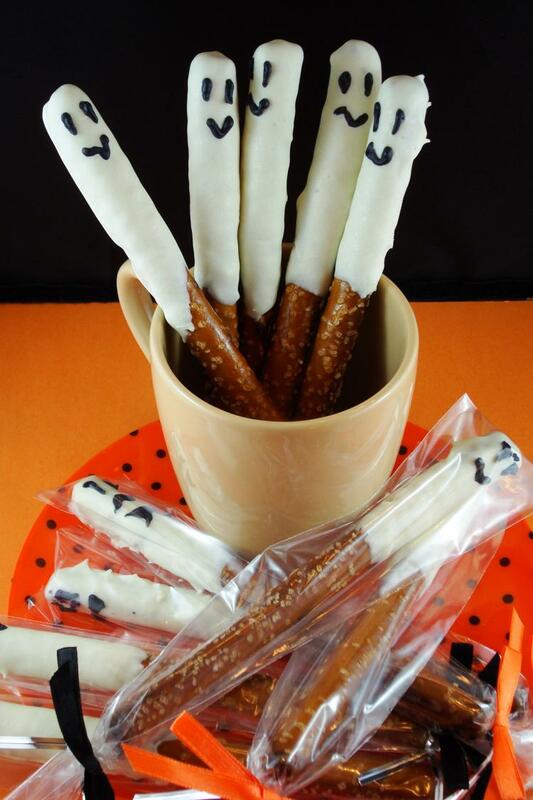 Frightfully easy ghost cookies to make with the kids. Yes, more of the white chocolate melt, but only 2 other ingredients: Nutter Butter cookies and mini chocolate chips. Fly over to Hands on Learning Fun for the details. What’s that you say? “Still don’t believe in no ghosts?” – Here’s the evidence, Ghost Poop. Can’t Stop Making Things has the tutorial for you. 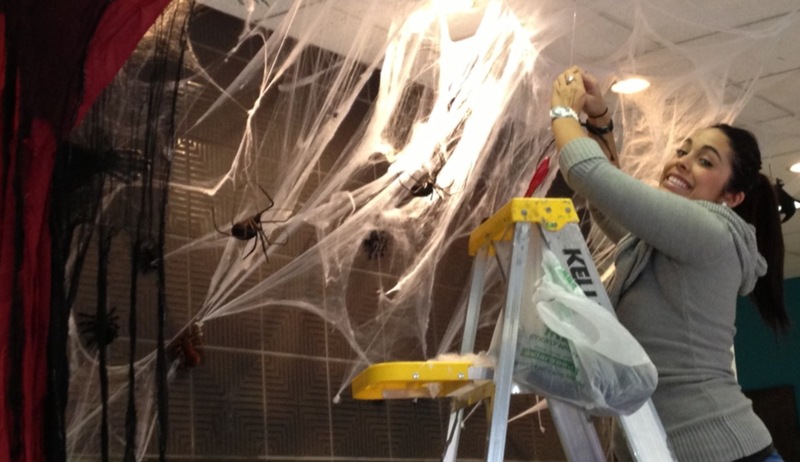 Our very own Spider-Woman Ana weaves her spooky webs in preparation for the National Costume Swap Day Party 2013. Hop on your brooms and fly in Saturday, October 12th for our annual National Costume Swap Day Party. Bring in gently used child size costumes and go home with a new-to-you costume. Exchanging costumes is a creative and eco-friendly way to get kids excited about recycling. Join us for tricks, treats, fun games, and prizes. Families are encouraged to bring in multiple costumes. Any left over costumes will be donated to St. Joseph’s Home for Children, a charity that provides basic needs and emergency shelter for children. Totally Kids fun furniture & toys and St. Joseph’s have successfully partnered in the past. Last year Totally Kids was able to donate a carload of Halloween costumes to children. 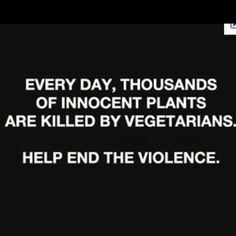 Our goal for this year is to at least double that amount. That’s a beautiful orange chandelier, but someone is trying to drive us batty. There will be a count the bats contest where all kids will win a FREE prize. 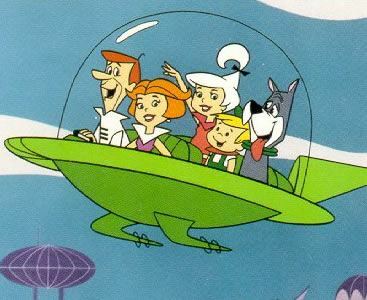 The Jetsons was first broadcast on this day 51 years ago bringing us a ‘clear vision’ of the year 2062. It was the first program ever presented in color for ABC Television. Some creative on the Hanna-Barbera team must have had a crystal ball when writing in flying cars, flat screen TV’s, tanning beds, video calls and a robot maid. Flying car, you want one? Check out Terrafugia, they’ll help you out with their Transfusion model that would have made George proud. Back in the 1960’s televisions were huge boxes with teeny screens. Not in George Jetson’s home and office; flat-screen televisions were mounted to the walls like picture frames. 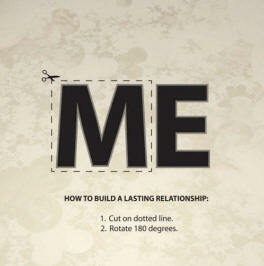 Imagine that? In one episode tanning beds were demonstrated and had three settings: Miami, Honolulu and Riviera. Now keep in mind tanning beds did not even appear until 1978. Judy, George’s wife would conveniently check up on him via video chat. Today, Hello….Skype, FaceTime and Google Hangout. Disappointingly though for robot maids. We need to move a little farther into the future for more than a clean floor. If you know of a robot more skilled than the iRobot Roomba, please, please let me know. 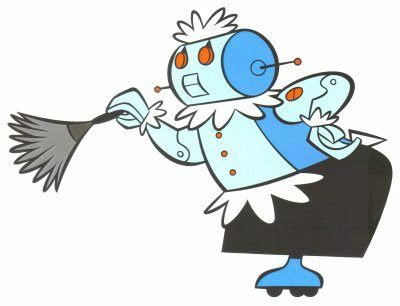 I’m still waiting for Rosie the Robot to join our household. Here in Minnesota we know it’s the beginning of fall when the air feels a little crisper, the leaves begin to change color, Halloween costumes and candy start appearing in stores everywhere. And the Starbucks pumpkin spice latte, right? Do you know when fall officially arrives this year? 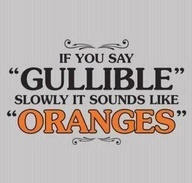 You are correct if you said today. Welcome Fall! The Autumnal Equinox falls on September 22nd 2013 marking the transition from summer to fall. The word equinox comes from the Latin words for “equal night.” The days will now be getting shorter and there will be more hours of nighttime darkness. 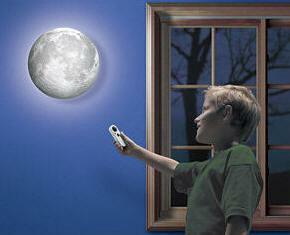 Have you seen the Harvest Moon this year? The “Harvest Moon” is the full moon closest to autumnal equinox. It has been positively spectacular here in the Northland. 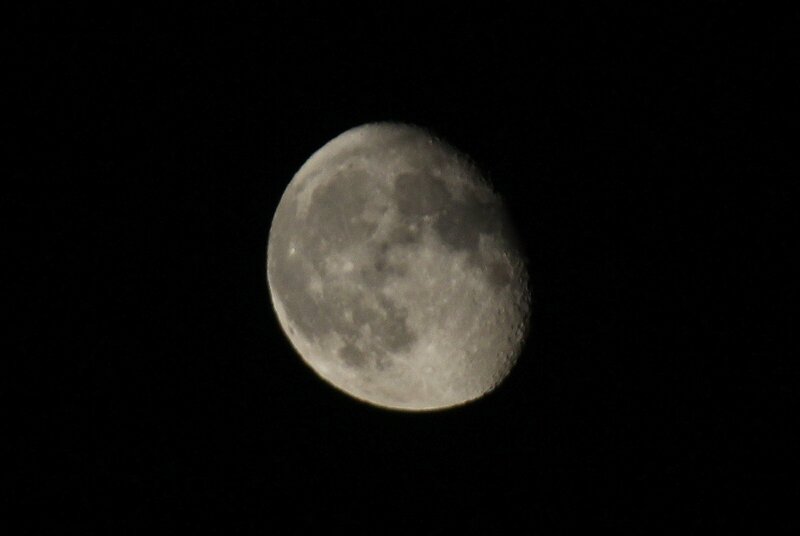 Tonight’s moon, shown above, is a little less full, but absolutely beautiful. Photo credit T.H. Throughout the year the Moon rises, on average, about 50 minutes later each day. You can have an educational Moon in My Room every night and learn all about its phases..
Everyone is always wowed with these falling leaves tortilla chips that are easy to make if you have a little time. Pop on over to Kitchen Witch to learn just how to make these leaves. 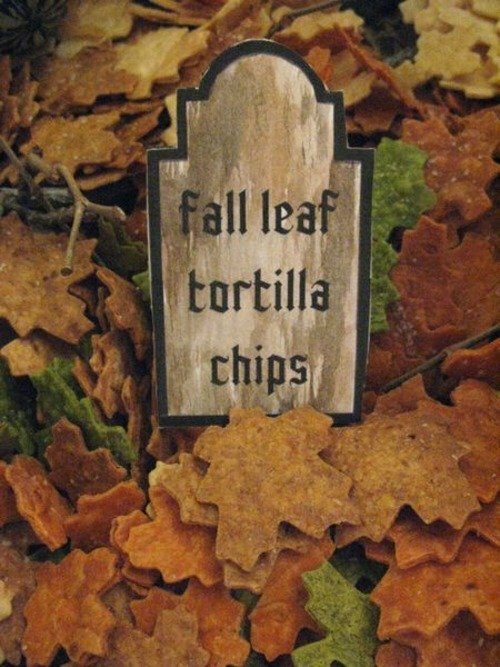 Have a Happy Fall! 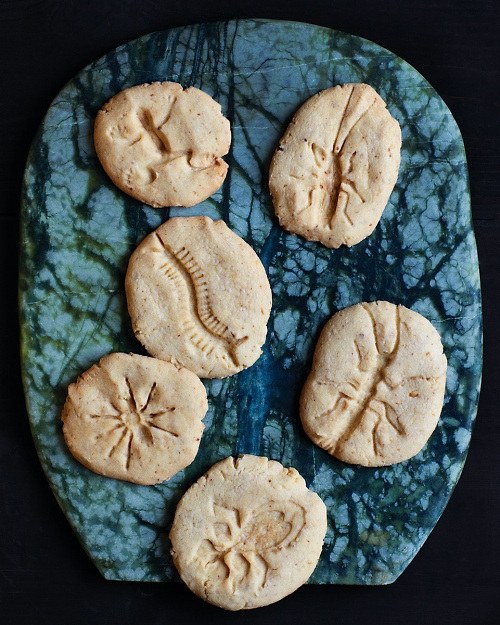 How about sending your budding paleontologist back to school with a batch of fossil cookies to share with the Science Class. Just the Simple Simon act of pressing a plastic insect toy into the top of a sugar cookie transforms the cookie into something so much more interesting. Another oh, Martha how do have so many great recipes? Recipe found at the Martha Stewart website. 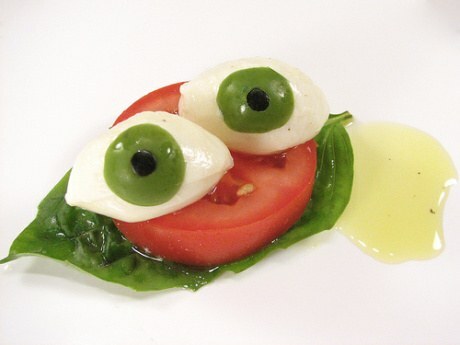 This weeks Recipe for Fun is an ideal creepy crawly cook together for even the youngest little ones. 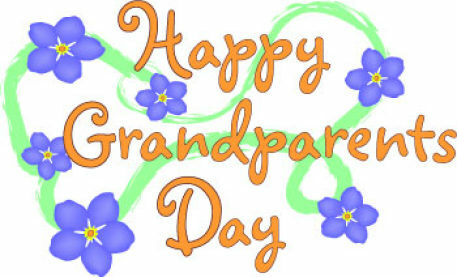 Calling all proud and loving grandparents! In honor of “National Grandparents’ Day,” Monday, September 9, Totally Kids fun furniture & toys would like to invite all grandparents to come into the store and enjoy 30% OFF* all toys and games now until September 9th! Remember: always free gift wrapping on toys. Grandparents will be asked to show a photograph of their precious grandchildren in order to get the discount. That shouldn’t be a problem for any grandma or grandpa! Also, Totally Kids will give away a FREE prize to all grandchildren 8 years old and younger, who bring in their grandparents. Totally Kids is a family-owned store that sells fun furniture for children, educational toys, games, dolls and doll houses, arts and crafts, dress-up costumes, puzzles, science sets and so much more. *Offer not combinable with other discounts, offers, or prior purchases.